What Is Adaptive Project Framework? Albert Einstein said, "The measure of intelligence is the ability to change." Yet, businesses often avoid change is often avoided because traditional project management relies on adapting goals and outcomes to the process, rather than adapting the process to the goals. As a result, project plans have little room to adapt to evolving needs or solutions. In today’s fast-paced business climate, where goals and outcomes are often moving targets, most teams cannot afford the inflexibility of the past. Businesses need to find the right project management methodology is crucial to run a team that can be responsive to change, rather than reactive to it. Adaptive Project Framework (APF), also known as Adaptive Project Management (APM), accommodates the unknown factors that can crop up during a project. It prepares teams to anticipate the unexpected and respond. Think of its core principle as "learning by doing." By approaching projects with the understanding that key components are constantly in flux, teams can adopt a flexible mindset to continually learn by re-evaluating results and decisions throughout a project. This requires regular communication with stakeholders at every level for the team to effectively adapt. So how exactly does APF work? Let’s break it down. The first step in the scoping phase is to identify the conditions of satisfaction for the project. In other words, stakeholders need to define what the project’s goals are and what a successful outcome looks like. Because if you don’t know where you’re going, you won’t know when you’ve made it there.In fact, executives said the most common factor behind project failure was a lack of clear goals, according to a 2017 report by PMI Pulse of the Profession. Without clear CoS, your project is essentially rudderless. Outlining the CoS directs the project and helps project managers keep the project on course throughout subsequent phases. For best results, have every stakeholder approve the CoS before proceeding. By including all stakeholders, you can avoid miscommunication on project expectations and adapt as needed. The Project Overview Statement is the deliverable from the CoS. This document outlines the final approved CoS signed by all stakeholders. Refer to the PoS throughout the project to evaluate the efficacy of your processes as you go. Although the PoS is approved at the beginning, it can act as a living document under APF. If the scope or goals of the project evolve, adjust the PoS to accommodate the changing CoS. Don’t forget to keep all stakeholders involved in the iteration to ensure everyone is on the same page. Prioritizing the requirements of the project further defines the scope of the project and also designates the order of implementation. There are a few ways to prioritize requirements, but the basic approach is to collaborate with stakeholders to organize the requirements into weighted designations (high, medium, low) with numerical values. However, keep in mind that while stakeholders should be involved in this process, the analyst and project manager should guide the discussion to ensure priorities are realistically assigned. What are the consequences for the business objective if we omit this requirement? Is there an existing system or process that could compensate? Is there any reason we can't defer this requirement until the next release? With careful prioritization, your team can focus on the right tasks at the right time. A WBS breaks the project components and processes down further into manageable sections. It provides both the framework for cost estimating and control as well as guidance for schedule development. Creating a clear WBS may sound intimidating, but a tool like Lucidchart does most of the legwork for you. 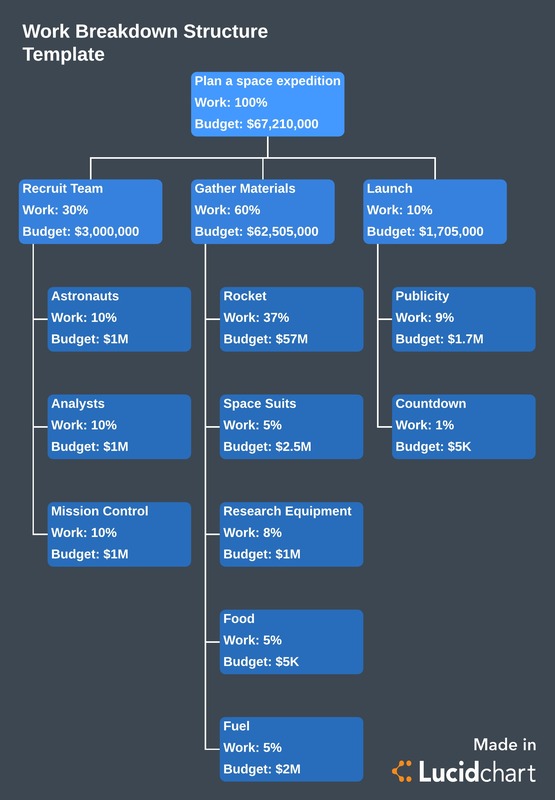 Intuitive features like drag-and-drop functionality, formatting options, real-time collaboration, revision history, and links to external documents make it easy to work with your team to create and implement an effective WBS flowchart. See our complete instructions on how to create a WBS or get started with the template below. Inflexible constraints are critical to the project and have little leeway. Adaptable constraints are negotiable and have some flexibility but should be optimized as a much as possible. And “may concede” indicates an area where trade-offs are possible to compensate for the other constraints. For instance, Project A might have a strict timeline but a flexible budget. Or Project B may need certain features (affecting the scope), but the timeline is adaptable. Your goal during this phase is to further define and plan the tasks you’ll be implementing during the development phase. This step includes breaking down individual tasks from the WBS, identifying task dependencies (or the order in which the tasks need to be completed), assigning out the work to team members, and scheduling the deadlines and timeframes for each portion of the project. The key difference between adaptive development methodology versus traditional project management (TPM) is that the timeline set during the scoping and planning cycles is fixed. In a TPM project, the scheduled completion date can be moved back to meet a deliverable. But in adaptive development methodology, if a deadline expires, the deliverable is put aside and reprioritized for the next cycle. The client checkpoint phase is a crucial part of the Adaptive Project Framework. This is the time to check in with the client to review the quality of the functionality delivered in the build cycle. Based on this evaluation, the client and project manager will work together to schedule any adjustments or course corrections needed for the next iteration. At this point, the process repeats itself until the project budget has been expended. In other words, the team returns to the planning cycle through the build and checkpoint phases until the project is complete. At the end of an APF project, managers and stakeholders meet to evaluate the success of the project, note what was learned, and define any improvements for the process in the future. Whether APF is the best method for your team depends on the type of work you’re doing, but the beauty of adopting this approach is that the process is adaptable to the project needs. Like traditional project management, the scoping and planning phase helps outline and direct the project. But with an adaptive framework, you can work collaboratively with stakeholders at every level to determine the goals and success of the project as it evolves, rather than waiting for the project to end to discover whether it met the client’s needs. This approach promises flexibility and savings when implemented correctly. But with so many iterations and collaborations, it’s easy for projects to lose focus fast. That’s why having the right tools can make all the difference. Reliability, ease of use, and ease of integration are the top three requirements project managers look for when shopping for software. Lucidchart meets all these needs and more, helping project managers increase efficiency and innovation by as much as 40%. With seamless integrations and simple group collaboration features, mapping out your project from scope to final review has never been easier. Get started today with your free Lucidchart account!